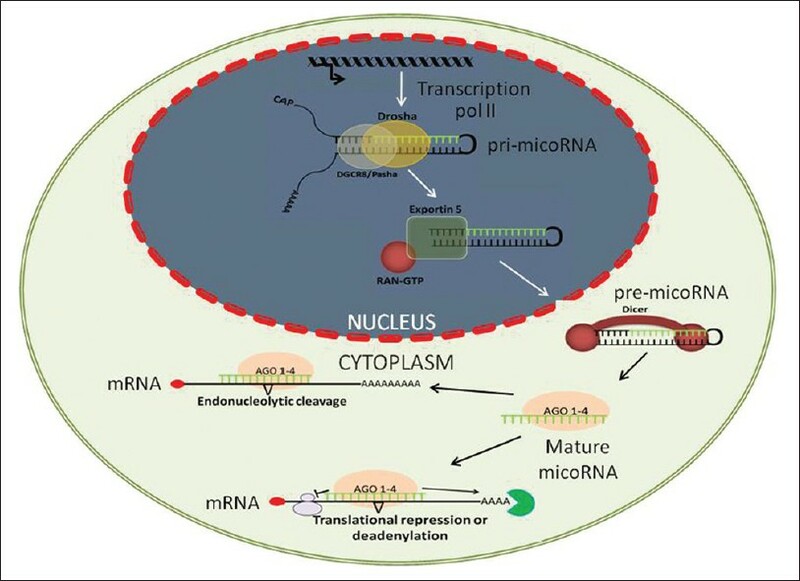 A new insights have come from studies in Caenorhabditis elegans, in which researchers have identified a new endogenous class of small noncoding RNA (22-25 nucleotides), termed as microRNAs (miRNAs) as developmental regulators. Here, we discuss some recent studies demonstrating the role of miRNAs in asthma, with the anticipation that these studies were likely to influence treatment, diagnosis, and management of asthma and other inflammatory disorders. use of miRNAs as a therapy, the use of miRNAs holds great promise as a new treatment. Future of miRNA-based therapy in case of pulmonary disorders, such as asthma, chronic obstructive pulmonary disease (COPD), acute lung injury (ALI), and acute respiratory distress syndrome (ARDS) seems to be promising as indicated by animal studies. 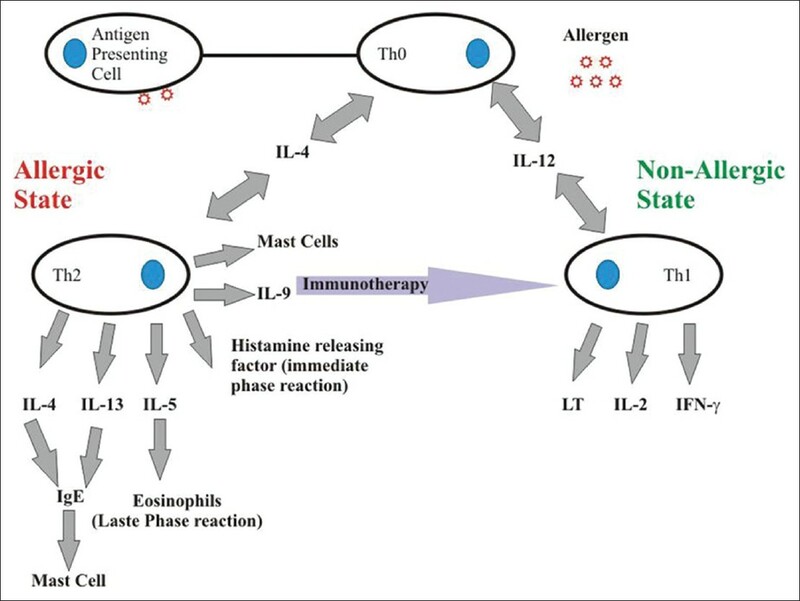 Allergen-specific immunotherapy is the therapeutic approach for allergic disorders with dysregulated immune responses, working through down-regulation of predominant T-cell and IgE mediated reactions by inducing immune tolerance by long-lived decrease in allergen-specific T-cell responsiveness through administration of allergen extracts in incremental doses. The potential candidates include mainly those with uncontrolled symptoms despite avoidance measures and medication use. Traditionally, immunotherapy is administered subcutaneously, although sublingual, mucosal, intranasal, intrabronchial, intralymphatic, and epicutaneous routes are also in existence. Currently, it has an established role in the treatment of allergic rhinitis, allergic conjunctivitis, allergic asthma, and insect sting hypersensitivity. Other disorders demonstrating significant improvement on immunotherapy include atopic dermatitis, food allergies, etc., Newer therapies, such as anti-IgE (omalizumab) used in combination with immunotherapy, have improved the safety and efficacy of immunotherapy. Future studies involving scientific research with the aim of improving patient outcome using safer forms of immunotherapy through recombinant technology, including allergens with reduced allergenicity and T-cell epitope based allergy vaccines without reducing immunogenicity, are in process. Background: Inflammatory lung diseases such as asthma are characterized by chronic inflammation, oxidative stress, and altered antioxidant defenses. Increased levels of reactive oxygen species (ROS) contribute to asthma exacerbation and cell damage. Exogenous supplementation of antioxidant combinations has shown potential in asthma management. Previously, a hypoallergenic mutated glutathione S-transferase (mGST) singly or in combination with reduced glutathione (GSH) showed reduction in airway inflammation in mice model. Objective: The present study evaluates the effects of antioxidants α-lipoic acid and α-tocopherol in combination with mGST or GSH in neutralizing the oxidative stress and reducing the inflammatory responses in a mouse model. Materials and Methods: BALB/c mice were immunized and challenged with ovalbumin, treated with different antioxidant combinations by inhalation, and sacrificed to evaluate inflammation and oxidative stress parameters. Result: Treatment with GSH + α-lipoic acid showed significantly reduced total cell and eosinophil counts in bronchoalveolar lavage fluid (BALF) and decreased infiltration of cells into lung interstitium, compared to ovalbumin group. Also, the treatment reduced interleukin (IL)-4 and ovalbumin-specific IgE levels possibly through modulation of redox-sensitive transcription factor nuclear factor-kappa B (NF-κB) levels. Administration of all antioxidant combinations decreased the ROS compared to ovalbumin group as indicated by reduced thiobarbituric acid reactive substance (TBARS) and 8-isoprostane levels in BALF. Conclusion: All antioxidant combinations of α-lipoic acid and α-tocopherol in combination with mGST or GSH showed reduction in airway inflammation and oxidative stress in vivo, but maximum therapeutic efficacy was observed in GSH + α-lipoic acid group. Therefore, a combination of antioxidants may prevent allergic inflammation in the best possible way. Background: The prevalence of asthma is increasing in the developing world. Asthma, management guidelines have been instituted to provide recommendations for the optimal control of asthma. This study evaluated the current level of asthma control as reported by the patients, which may be a reflection of adherence to guidelines. Materials and Methods: Asthma patients referred to a respiratory diseases clinic were recruited for the study. The asthma control test (ACT) was administered on the patients and data were also obtained for medication use and disease monitoring. A total ACT score of <20 signified poor control. Results: Out of 78 patients, 70 completed the survey (89.7%). The average age of patients was 46 ± 18 years (mean ± standard deviation). The average ACT score was 14.4 ± 4.8 82.9% of patients had poor control. 57.1% of patients who perceived their asthma to be well or totally controlled were objectively assessed to be poorly controlled. More than half of the patients used short acting β2 agonist alone and only 20% used inhaled corticosteroids for maintenance therapy. Thirty eight patients made unscheduled emergency room visits in the past 12 months and 68.8% could not use their inhaler devises well. Emergency room visits (odds ratio [OR] 9.5) and poor inhaler technique (OR 18.9) was independent predictors of poor asthma control. Conclusion: The current level of asthma control among patients in Uyo is below guideline recommendations. Management of patients did not appear to follow guideline recommendations and patients tend to over-estimate their disease control. Introduction: Systemic lupus erythematosus (SLE) is a multisystem autoimmune disorder, the expression of which is greatly influenced by the combined effect of genetic, environmental, demographic and geographical factors. Various studies regarding clinical and immunological profile of SLE patients in India has been reported from a different region of India, especially from the urban area. We performed this study to understand the clinical and immunological profile of the SLE patients presenting to tertiary care center in rural central India. Materials and Methods: This study was conducted at a rural teaching hospital in central India. All patients' records from 2007 to 2012 available with hospital having a discharge diagnosis of SLE and fulfilling the revised American College of Rheumatology criteria (1997) for SLE were analyzed regarding clinical and immunological profile. Results: We found 87 SLE patients out of 52,133 patients admitted in medicine department from 2007 to 2012 in the hospital record and included in the analysis. Nearly, 98% patients were female and 84% patients were under the age of 40 years. 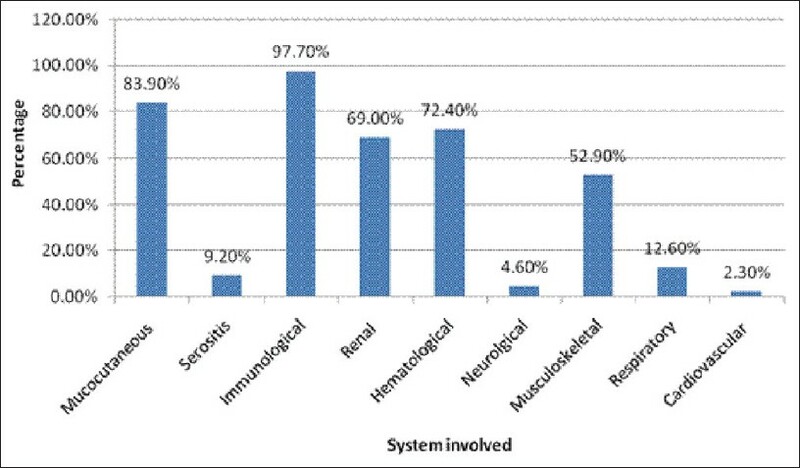 Common features present in these patients were immunological (97.7%), mucocutaneous (83.9%), hematological (72.4%) and renal (69.0%). Malar rash was the most common clinical feature presented in 71.3% patients followed by photosensitivity (63.2%) and oral ulcers (42.5%). Lymphopenia was the most common hematological abnormality present in 48.3%. Involvement of neurological, cardiovascular and respiratory system was found to be less common. Anti-nuclear antibodies were found to be positive in nearly 98% patients. Conclusion: Analysis of clinical profile of hospitalized SLE patients shows that the disease is more common in female patients, especially during the child bearing age group. The present study shows high frequency of mucocutaneous, hematological and renal manifestation in these patients. Background: The cases of bronchial asthma are mainly diagnosed and treated by primary and PG General Physician. Asthma is not adequately controlled due to poor approach to diagnosis, inadequate inhalation therapy and lack of knowledge of asthma among practitioners. Objective: To evaluate the previously diagnosed cases of bronchial asthma made by various practitioners in relation to their diagnosis, treatment, control profile and asthma education before reporting to tertiary care hospital. Materials and Methods: A prospective study of previously diagnosed cases of bronchial asthma was done from the period of July 2010 to December 2011. One hundred twenty patients over 18 years of age were studied reporting to our tertiary care medical teaching hospital. Results: Out of 120 cases, 77.5% (n = 93) were males and 22.5% (n = 27) females with maximum cases (94.2%) under 45 years of age. Majority of cases (52.5%) were diagnosed by Postgraduate (PG) General Physicians, followed by 30% by Graduate doctors and only 17.5% by Respiratory physicians. In 80% cases diagnosis was established on the basis of history and clinical findings, while spirometry was used in only 20% cases. Inhalation therapy was prescribed in all the cases by Respiratory physicians, in 90.5% by PG General Physicians and in only 8.3% by Graduate doctors. Overall only 20% (n = 24) cases had their asthma under control, of these 62.5% were treated by Respiratory physicians and 37.5% by PG General Physicians and in none by Graduate doctor. 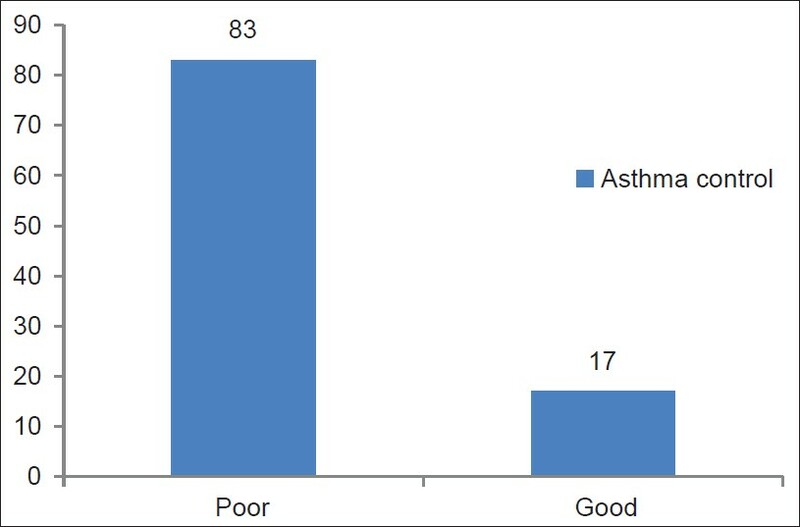 Asthma education of patients rendered by various physicians showed marked variability ranging from nil to 71.5%. It was nil in patients treated by Graduate doctors and poor in treated by PG General Physicians and not even satisfactory in those treated by Respiratory physicians. Conclusion: Majority of bronchial asthma cases are treated by PG General Physicians and Graduate doctors in the community. Spirometry for diagnosis of asthma was very much under used. Awareness of using inhalation therapy was very poor among Graduate doctors. Poor knowledge of asthma education at each level of practitioner is the major reason of poor asthma control. Purpose: Allergic patients have a specific psychological profile and experience a specific mental and emotional context. This study examines the psychological traits of allergic patients in comparison with those of control group. 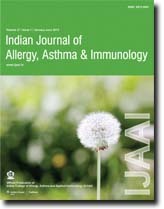 Materials and Methods: This was a case-control study in which 102 men and women allergic patients who referred to Sari Tooba clinic were selected. One hundred and two people from the normal population were selected as the control group and were matched with allergic samples. Minnesota Multiphasic Personality Inventory (MMPI2) questionnaire was used for data collection. The data were analyzed by variance analysis, t?test, and correlation tests. -test, and correlation tests. Results: The average scores of patients in MMPI2 test for hypochondriasis, hysteria, depression, psychasthenia, and social introversion were significantly higher than for paranoia (P < 0.05). Also, allergic women obtained higher scores in hypochondriasis, psychasthenia, masculinity-femininity, hysteria, and depression scales than allergic men (P < 0.05). These results also showed that hypomania has a higher frequency among asthmatic patients than in patients with allergic rhinitis (P < 0.05). Conclusion: This study showed that psychopathological traits such as hypochondriasis, hysteria, depression, psychasthenia, and social introversion have a higher frequency among allergic patients than in the general population. These results emphasize on considering psychological interventions along with medical treatments. Silkmoth scales are allergens that cause several disabling hypersensitive lung diseases like asthma and allergic rhinitis in sericulture grainage industrial workers. Immunopathological responses of silkmoth allergen on primary and secondary lymphoid organs were studied in albino mice. 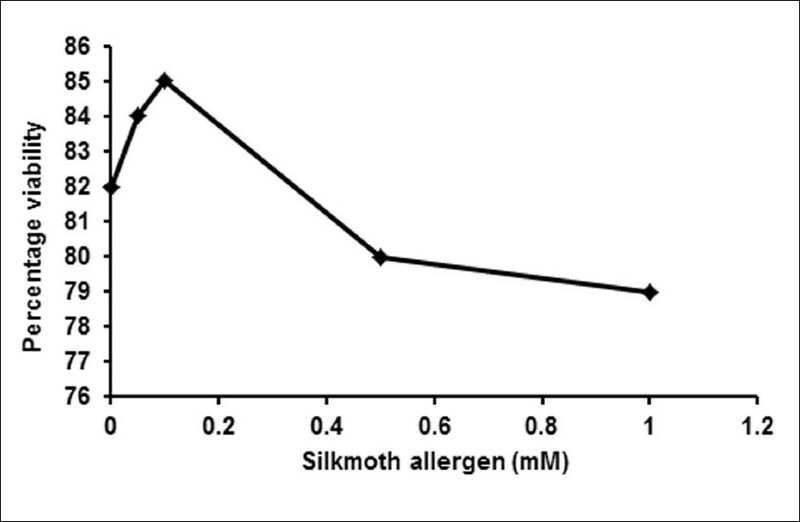 Mice were immunized intraperitoneally and then subsequently challenged with silkmoth allergen intranasally. The mice were then evaluated for total serum IgE, eosinophil viability, and culturing of splenocytes in the presence of PHA, eosinophil peroxidase of bone marrow cells and histology of the thymus. The results indicate that the sensitized mice shows increased levels of IgE, decreased splenocyte viability and cell depletion in the thymus, and increased eosinophils in the lungs. The stimulated spleen showed a typical Th 2 pattern in all allergen sensitized animals. The role of fluorodeoxyglucose positron emission tomography (FDG-PET) is being increasingly recognized and investigated as a functional imaging technique to explore nonmalignant thoracic disorders. 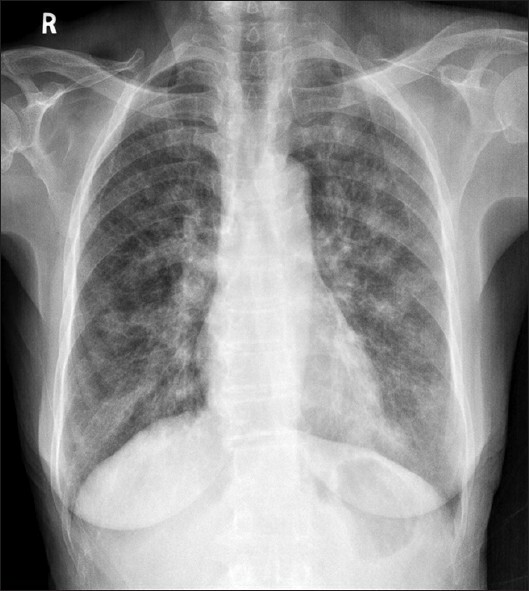 We report a case of a 72-year-old woman who presented as interstitial lung disease (ILD) due to tropical pulmonary eosinophilia (TPE). FDG-PET helped in confirming disease activity and response to treatment with diethyl carbamazine (DEC). The role of FDG-PET in TPE has not been reported previously. Henoch-Schönlein purpura (HSP) is defined as a vasculitis with predominantly IgA deposits in the walls of small vessels in the skin, gastrointestinal tract and kidney associated with arthralgias or arthritis. The etiology is unknown, but HSP follows an upper respiratory infection. Infection agents, some medications and some toxins were reported as a trigger for Henoch-Schönlein purpura. We report a 6-year-old boy with typical clinical and pathologic features of this disease that was developed after wild bee sting and our case is an example of insect byte as a trigger agent for Henoch-Schönlein purpura.